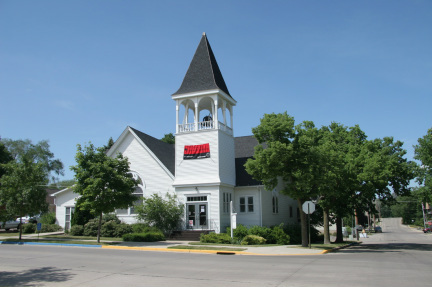 Remember – our new start time for service on Sunday is 9 a.m.
St. Paul Lutheran Church is hosting an Ice Cream Social on July 15, 4:45-6:45 p.m. Information on back tables. Concerns: Family of Vern Vosberg, Peggy Kvam’s mother, Marv Nordang, Phyllis Lingen family, Kathy’s Dad (Wayne Ripley), and Bill Webb. Joys: Peggy Kvam saw lots of family (but in Arizona 115 degrees), Laura Butterbrodt crowned Western Fest Princess, Audrey saw perfect rainbow, good to see visitors (Kathy Ripley, Katherine Dibble and Pat Putnam). Andersons saw lots of family and three new great granddaughters, Dan and Paul thankful to all who came to house warming. Gay marriage legalized in all of U.S. Sharon and Katherine’s class reunion and celebrating 75th birthdays (Sue Krinke also). Marriage of Kyle and Whitney Mooney. Katie Kvam heading back to States today.